I have finally figured out a way to explain massive annual geek convention Comic-Con to people who have never been there: It's like Las Vegas for nerds. People go there to see shows, dress up, then get shitfaced and do stupid things. But of course, it's something more than that, too. 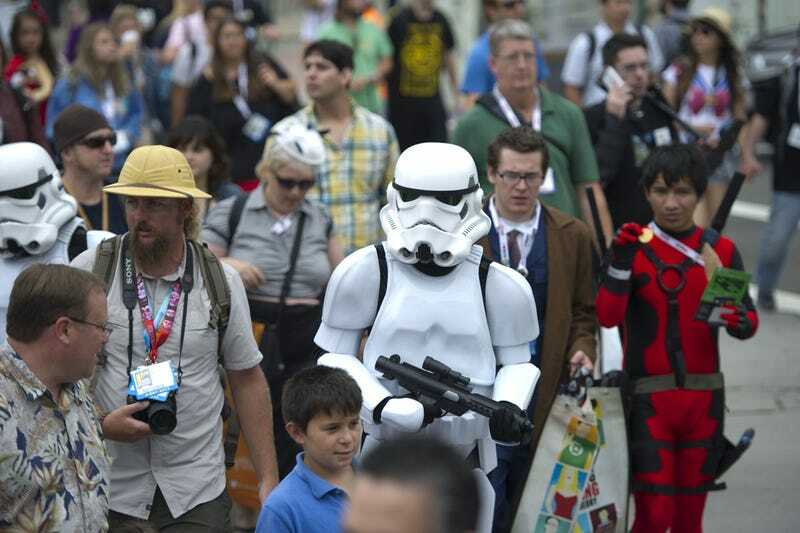 Comic-Con ended today, after five days of pop culture freakout with over 130 thousand attendees flooding San Diego's convention center. Every year at Comic-Con, there are the major shows that anchor the event: the geek comedy/music festival W00tstock, the celebrity panels and exclusive footage in cavernous Hall H, sneak preview screenings, and live events like this year's Patton Oswalt show and the taping of the Thrilling Adventure Hour podcast. Plus there are insane parties until the wee hours of the morning, which fill the streets around the San Diego Convention Center with carousing cosplayers and drunk geeks screaming at each other about Batman continuity. Instead of gambling, there is the show floor, where vendors sell everything from toys and comics, to expensive movie souvenirs and jewelry. You can waste thousands of dollars on shiny things of dubious value. But a few lucky winners will walk home with valuable swag that they score for free, just for being at the right studio and publisher-sponsored booths at the right time. Though it's a fantastic sensory overload, of both things and incredibly-dressed people, there's also that Vegas feeling of desperation there too. People wait in line all night for Hall H, and there is no wrath like that of a fan scorned. We're not gambleholics, but we are thrilloholics, fantasy bingers who need our stories like junkies need drugs. It may sound like I hate Comic-Con, but I don't hate it. I am in awe of it in the old-fashioned sense. It fills me with fear and existential dread, as well as crazy wonder. Entertainment is serious business, and that's because it can change the world. Stories don't just help us cope with a bad day at work. They give us space to reimagine the world — especially the imaginative tales of heroism and adventure that geeks love. There's one way that Nerd Las Vegas is different from the real Las Vegas. What happens at Comic-Con does not stay there. It goes out into the world, changing everything it touches the way the best stories do.